In the fall of 1946, less than a year after the close of World War II, Laclede Cab Company first began operating on the streets of St. Louis with 75 permits granted by the city of St. Louis. Headquarters for our startup operation was located at 923 North Seventh Street downtown – about one block north from the future site of the Edward Jones Dome. Many of our senior customers may remember those days, riding in a distinctive Laclede Cab red and black Lasalle – or dialing “OL2-3456” to reach us from direct lines located throughout the city. Laclede Cab quickly established itself as an industry leader and innovator with uniformed drivers, early package pickups and a computerized charge system. Then in September 1947, just one year after beginning service, Laclede Cab purchased the first 2-way radio system in metropolitan St. Louis. Less than a decade later, 1955 brought a period of growth and expansion for Laclede Cab with the purchase of 15 “Sparky’s” and 20 “RedTop” cabs. And in 1975, Laclede Cab purchased the Black and White Cab Company, becoming the metro St. Louis’ largest cab company and servicing well over one million calls per year. In 1996 Laclede Cab came under new ownership and began another period of growth – and reorganization. 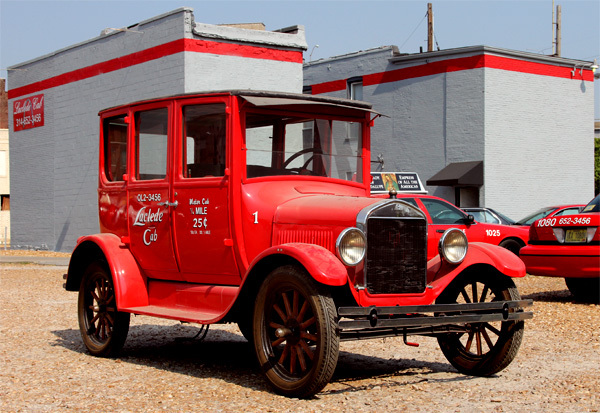 While our distinctive red color was retained, gone were the black fenders of the past and the entire vehicles became bright, solid red with white lettering. The entire fleet was upgraded and the average taxicab age decreased dramatically. And rather than rates going up, Laclede Cab immediately took their rates down. Currently, Laclede Cab’s business office is located at 600 South Vandeventer. We’ve earned our business through top of the line equipment, prompt courteous service and fair pricing. And our improvements didn’t stop in 1996. In 2009 we upgraded the Call Center in our Dispatch Department, computerizing the process but keeping our live, friendly order takers. And in 2010 we installed the newest, most sophisticated GPS Dispatching system in the St. Louis metropolitan area. Pickups today are faster than ever before, our fleet is even larger, yet our pricing remains low and remains fair. We’d like to thank you for stopping by to check us out. Put us in your cell phone and give us a call next time you need cab service. At Laclede Cab, we know we need you – and we’re anxious to earn your business!